Have you ever tried combining some toasted corn kernels with black beans? Our family tried this out some time ago, modifying a recipe we found and it became an instant family favorite meal option. 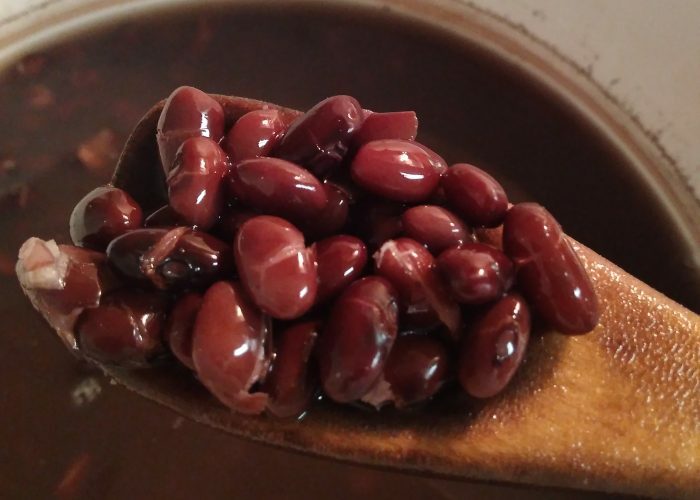 It’s super easy to make because it builds on a ready-to-heat can or carton of black bean soup as the base, with more added beans and veggies to pump up the taste and nutrition. Try it out and see for yourself! This vegan, dairy-free and egg-free recipe is a fantastic combination of health, taste, colors and texture. Makes a hearty meal when paired with pasta or a sandwich. Heat a saucepan over medium heat. Add 2 teaspoons of olive oil and heat the frozen corn kernels, stirring occasionally until a toasted corn smell begins and the kernels begin to brown. This will take about 10 - 15 minutes. Meanwhile, rinse and drain the canned black beans well (or use home cooked black beans). Put the measured amount into a pot with the ready-to-heat commercial black bean soup. Into this pot, add in 1 – 2 cups of water (or vegetable broth) or more depending on how thick you would like your soup. Cook over medium heat until the soup starts to gently bubble, then turn down the heat setting to have the soup simmer gently. Add additional vegetables if desired (see notes below). Let the soup cook for 10-15 minutes at a gentle simmer, until the beans soften further and the mixture thickens. Stir the kernels into the soup pot with black beans. Remove from the heat setting. Add 1/4 cup of chunky salsa (homemade or store bought) in and stir well. Serve warm! You can adjust the amount of water you add, depending on how thick you would like the soup. Instead of adding jarred or fresh salsa into the soup during the cooking process, you can choose to wait to add the salsa individually at the table according to each person’s taste preference. It is very easy to modify this recipe if you would like to add in more vegetables. For example, you could add in ½ cup of chopped button mushrooms, a diced orange bell pepper or a 1/4 cup of chopped mini zucchini wedges into the soup at the beginning when heating up the black beans with water. Another delicious alternative is to cook pasta separately then add some into the final soup before serving. This soup can be served with avocado wedges or guacamole and tortilla chips. To adapt this to a toddler’s meal: You can set aside some of the black bean corn soup for your toddler, prior to adding the salsa. This is so that you can decide how much to add of the salsa (if any) before giving to your toddler. Then you can put some cooked pasta and/or broken up tortilla chips (allow the chips to soften into the soup before offering to toddler) into the soup to serve as an all-in-one meal. Alternatively, offer the black beans, pasta and corn on a plate as delicious finger food pick-me-ups! ← What Are Ways to Cook Beets?